Submitted by Culver Wood on Thu, 06/26/2014 - 05:00. Employment in auto industry grow when the requirement and sale increase. These type of things happen in the market value and how to develop the industry in a proper way. Many type of people do the different type of jobs in the industry, here they share some informative things and that should be very helpful. Submitted by davisknight581 on Sat, 06/21/2014 - 05:16. In every industry, there are many type of people do the job in variety sectors but how can they continue in a proper way is most important. Auto industry also engage many people for their work, sometimes, there are many type of workers work, sometimes problem created due to the market strategy. Submitted by jackkromer on Thu, 06/05/2014 - 07:01. Auto industry is the market that growing in a positive way in society as well as it is providing the positive effects on the society. From several survey and effective discussions it is found that the market is growing day to day due to the demand of various types of car. From the above graph it is proved that the people who have the employment in the auto industry have the knowledge about this type of inventions. If you have your own BMW car and you are facing any kind of problem in it then visit to BMW repair Los Angeles. Submitted by Abrahamson on Tue, 08/06/2013 - 03:41. Submitted by sally on Thu, 03/17/2011 - 09:13. I can that the employment rates have dropped in recent years, I wish you had some statistics on that starting from 2008, I am sure we would have witnessed some interesting trends. I am still waiting for a price reduction of the hybrid cars, only after that I will be able to afford one. Until then I am just keeping my good old car, I have car insurance Ireland quotes on it so it's pretty convenient at the moment. Submitted by petty on Wed, 03/18/2009 - 00:11. 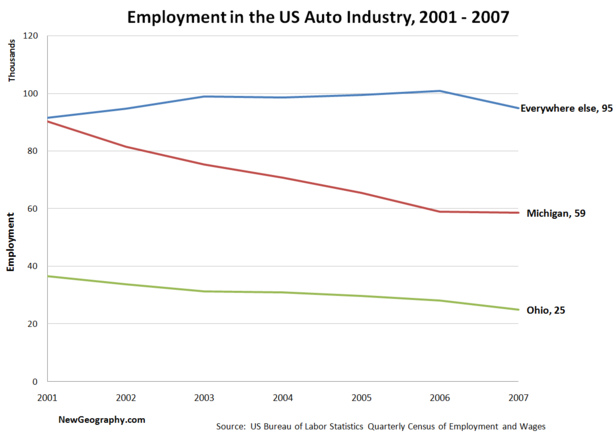 It shows the sudden decline of employment in the auto (car parts) industry especially in Ohio and Michigan. How about 2008? Submitted by amberu on Mon, 03/21/2011 - 14:09. Well with the economic recession it is no wonders employment has gone down. And so have the car sales , the only think good about this is that the car parts business has gone up , people prefer to buy new parts like brake rotors and pads , rather than buy a new car.